2. The dredging contractor is planning to continue dredging South Bay until complete or the end of September (whichever comes first). At that point, they will resume work at O’Brien Shoals. 3. Lake users should continue to avoid the area between O’Brien Shoals and the east shoreline, as well as the Troy Creek inlet at Deep Springs Wood Country beach. 4. Lake users are again reminded that the Nippersink Creek Inlet and entire South Bay have been designated as “No-Wake” areas, and marked with No-Wake buoys. Lake users are also reminded that MPOA decals MUST be permanently affixed to the watercraft it is registered to. The Wonder Lake Marine Patrol has been issuing tickets for No-Wake and decal violations. 5. 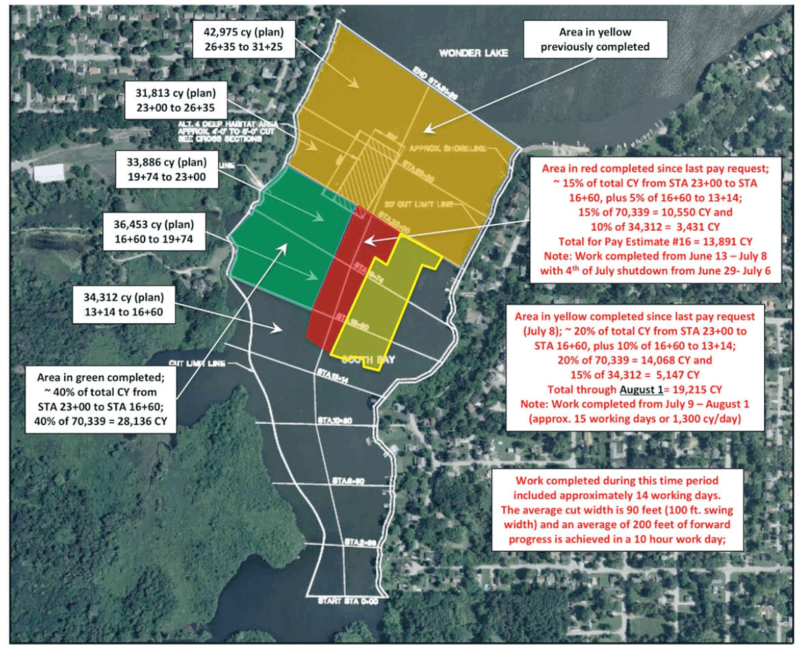 In last month’s report, I briefly discussed the factors that the MPOA considers when deciding whether a “No-Wake” or “Lake Closure” is warranted due to heavy rainfall or other events. The following article provides a good summary of how other lake managers have to make similar decisions.